A lively correspondence about starting a "New Church summer school" occurred between Rev. 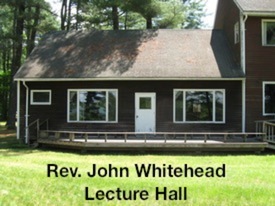 John Whitehead, Rev. Herbert Small, Rev. Baman Stone, and Walter A. Robinson. Rev. Herbert Small leads The New England Summer School in Center Lovell ME, attended b y more than 50 people. Morning and evening lectures by Rev. Julian Smyth (president of Convention), Rev. Frank Sewall of Washington DC, and Rev. Wm. Worcester (dean of the theological school). Reception held at the nearby home of Judge Job Barnard. The New England Summer School held its second session at the Portland New Church in Portland ME, again lead by Rev. Herbert Small and again attended by 50+ people. Morning and evening lectures by Rev. Julian Smyth (president of Convention), Rev. Adolph Roeder of Orange NJ, Rev. John Whitehead of Cambridge MA, Rev. Jacob Werren of the theological school, and Judge Job Barnard of Center Lovell ME. Various cultural and social outings each afternoon. The New England Summer School officially cancels its third session in a July issue of the Messenger. 1. Rev. Louis A. Dole is on the lecture staff at Almont Summer School (now called Almont New Church Assembly) in Almont MI. 2. Rev. Louis & Anita Dole move to Fryeburg ME where Rev. Dole begins serving as the pastor of the Fryeburg New Church. 3. Rev. John Whitehead, Rev. Louis A. Dole, and Mr. Walter A. Robinson decide to start a "New Church Summer School" in Fryeburg ME the following year with Rev. Louis A. Dole as it's first president. First s ession. One week. Held at the Fryeburg New Church with meals at the New Church Hall (now the Fryeburg Grange Hall) and rooms in the village, with young adults tenting at Lovewell's Pond. Afternoon lectures by Rev. Wm. L. Worcester, Rev. John Whitehead, Rev. Louis A. Dole, Rev. Paul Sperry, Rev. George H. Dole. 1. Session extended to 2 weeks. Rev. Harold Gustafson and Rev. Paul Dresser added to staff. 2. Outing Day officially starts. The announcement of the session in The New-Church Messenger reads, in part: "one full day of each week will be devoted to an excursion or general outing...", hence the beginning of what was called Excursion Day through the mid-1960's or so, and which continues to this day as our weekly Outing Day on Wednesdays of each week. 1. A "building fund" is started. 2. "This year was significant as marking the date of the first Summer School romance" (source: The Early History...). 3. The first known "Round River" canoe trip. For the first time, a possible permanent site is looked at, but deemed insufficient. Co-founder Walter A. Robinson passes on to the spiritual world. 1. Morning chapel before the lectures is introduced. 2. From the report of the FNCA business manager, Rev. Harold R. Gustafson: "Interest has also been stimulated in the idea of purchasing a permanent site for the School. ...We feel that the Summer School is no longer an experiment and that it will be a permanent and growing institution." A second possible permanent site is looked at, but again, as in 1924, recommended against. 1. Housing and meals now held at Fryeburg Academy. 2. Committees to draw up official by-laws and to look into incorporation are created. 3. For the first time, two "young people" are "hired" to wait on tables, take care of the dining hall, and do the dishes in exchange for their board. This eventually became the standard for all teens at camp. 1. The Assembly incorporated as a non-profit, religious organization and for $650 bought 12.5 acres on the Saco River near (but not abutting) the State Line, known before then as the "Frank A. Kennett" property. Thereafter, members referred to it as "The Promised Land". 2. 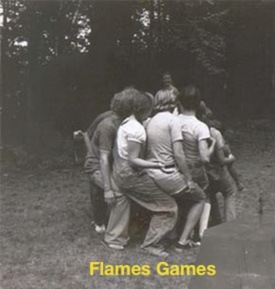 The young adults, still tent camping at Lovewell's Pond, one night around the campfire decide to start a camp group for the young people, calling it The Flames. 3. The first known report of what came to be known as Polar Bear Swim. 1. First building: the present day Kitchen. 2. After scrambling down the bank to the river to swim the previous year, by Tuesday of the first week "we had a path and a landing." 1. 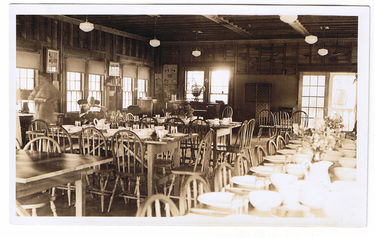 The current Dining Hall was built. It was referred to as the "Assembly Room" with the back half used for dining, and the front half for lectures and socializing. The back field held a lawn tennis court. Lectures and Flames classes were held on the grounds; Sparks classes were held in town at the Fryeburg New Church. 2. The FNCA gets it's first piano. The Fryeburg New Church parsonage in town was given a new piano so they donated the old one to the Assembly. It is extremely likely that it is the antique Square Grand Piano that we still have on the stage in Whitehead Hall. 3. First mention of an Auction at the Assembly, with Gus Bischof as auctioneer. Preceeds went to the Building Fund. 4. Co-founder Walter A. Robinson passes on to the spiritual world. 1. A "Fryeburg Carnival" was held at the Boston New Church as a fundraiser for the Assembly Building Fund, featuring classical music by the Lawrence Capon trio, "Blue Beard" operetta in two scenes with the libretto © Trevor 2011by Alice Monroe Foster, a buffet supper, dancing, group singing, a display of photos, as well as: "Side Shows, Indoor Sports, Fortune-telling, Candy and Cake Tables, Ice Cream and Punch". " 2. 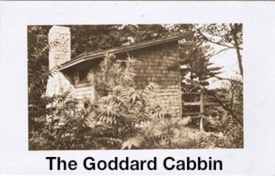 First cabin built: the Goddard Cabin. 3. First "young people's" class. 1. Third week is added to the session due to a full solar eclipse the week following the regular dates. 2. From the Summer issue of the New-Church League Journal: "At least one tennis court will be ready for use this summer. ... [W]e have ten new dining-tables, a full outfit of new table silver, a fire-screen, andirons and fire-set, screen doors, and a reading lamp — all gifts of friends of the Assembly." First known record of women on the lecture staff, with lectures by Miss Elizabeth Beaman and Miss Lilybell Bates. First known record of the Sales Table. 1. First known meeting (but quite possibly not the first) of the "Ladies of the Assembly", a gathering of all the women at camp to raise money to help fund the FNCA. First president: Mrs. Asa Goddard. 2. What came to be known as the Faxon Nature Trail is "cut along the river bank the length of the Assembly grounds." 5. From the bulletin: "The Assembly is pleased to offer a series of lectures this year on "Music of the Church" by Mr. Horace B. Blackmer, organist of the New Church in Boston. His lectures will be illustrated at the piano and interspersed with singing." 4. From The New-Church Messenger, September 18, 1935: "Note: A movie film of two reels, part in color, taking thirty minutes, showing all the activities of this 1935 Assembly — lectures, ministers, attendants, classes, sports, and the buildings and scenery — will be available after October 15th for advertising the Assembly. A 16-mm. projector is necessary. 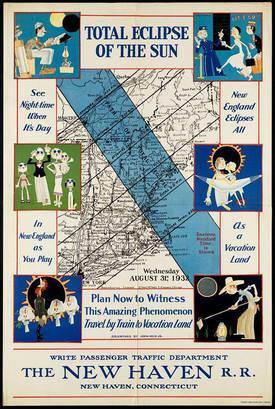 Apply for dates to F. W. Faxon, Roslindale, Massachusetts." 1. 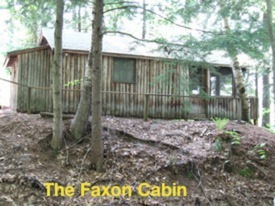 The second cabin is built: the Faxon Cabin. 2. A "Committee to keep the Summer-House" (now the Main Building) is created. It would eventually become today's Buildings & Grounds Committee. 3. The Twitchell Memorial Fund — named for Miss Frances Twitchell, the FNCA's first treasurer who died before this year's session — is initiated to "to reduce the indebtedness of the Assembly." 4. From the bulletin: "During the third week... a special course of training for teaching in New-Church Sunday Schools will be conducted under the joint auspices of the Assembly and the American New-Church Sunday School Association." 2. The Ladies of the Assembly officially changed their name to "The Women's Auxilliary of the Fryeburg New-Church Assembly". The third cabin is built: the Bellows Cabin. © Rev. Susannah Currie 20171. After 20 years, Rev. Louis A. Dole steps down, with Rev. Charles H. Kuenzli becoming the second FNCA president. 2. Chalmers' Lodge is built. 3. The Claxton Cabin is built. The Assembly did not meet because of World War II. 1. Rev. Kuenzli having passed on, Rev. Louis A. Dole agrees to be president for one more year. 2. Brand new Navy surplus tents are purchased that are "far better than those previously used, in that they are fire resistant and insect proof". 1. "City electricity" reaches the Assembly, the Main Building is rewired, and 2 electric stove are installed in the Kitchen. 2. Mr. F. Gardner Perry becomes the third FNCA president. 1. President F. Gardner Perry requests table space at Convention for "an exhibit of the Fryeburg Assembly." 2. 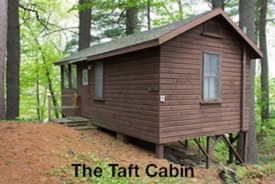 The Taft Cabin is built before the session. It's first resident for all three weeks: Florence Murdoch. 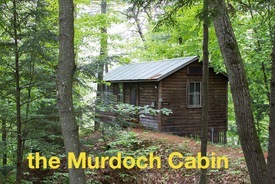 The Murdock Cabin is built by artist Florence Murdoch. It is still known as "the artist's cabin". 1. The 25th session of the FNCA received much attention as an "Anniversary Session" with reunions of the "young people" as well as many "old timers" attending after many years of absence. © Jon Cousins 20132. 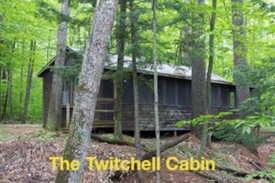 The Twitchell Cabin is built in honor of Frances Twitchell. Mrs. Twitchell was the Assembly's first treasurer who also served for a bit as recording secretary and was one of the original signers of the Assembly's constitution in 1921. © FNCA 19623. 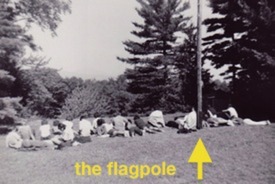 Using money from the Women's Auxiliary, a wooden flagpole made from a tree grown on the Assembly property was erected on the upper lawn at the center of the top of the hill, and the American flag donated in 1941 was (finally!) raised at the Assembly for the first time on August 13, 1950 at 8:00 in the morning. 1. Mrs. Asa Goddard donates funds to enlargen the porch of the Goddard Cabin, roof it over, and screen it in. 2. A fenced in play yard for the children was built in the grove of trees between the Main Building and the boys tent (near where the end of Whitehead Hall is now). 1. The first Sales Table Auction is held. 2. Rev. William R. Woofenden first elected to the Board. 1. The FNCA gets its first laundry machine, a Bendix Washer. 2. A wooden tent platform is built near the Faxon Cabin for a new tent to house just the "little boys", who up until now had been sleeping in a tent with the teen and college-age boys; hence, the beginning of the Little Boys Tent which was where the cement slab with the clotheslines is currently next to the Mack Cabin. 3. The Assembly pays off "the only outstanding mortgage on the present buildings". 4. A spotlight is installed on the ceiling of the fireplace end of the Dining Hall to light the lecturn for the lecturers and preachers. 1. The lectures are tape recorded (possibly for the first time) and copies made available by the "young and energetic" Rev. Wm. Woofenden. 2. Leonora "Orah" Hutchins Bray, wife of Rev. Everett K. Bray, dies at camp on August 23. $500 is collected to build a double cabin in her honor. 3. From the report of the Trustees at the Annual Meeting: "Speed limit signs have been placed. Parking space signs and road signs indicating "SLOW — HIDDEN DRIVE 500 FEET" to protect the Assembly entrance road have been approved and will be installed." 4. The Swedenborg Foundation donates a full set of the Standard Edition of the Writings. 2. 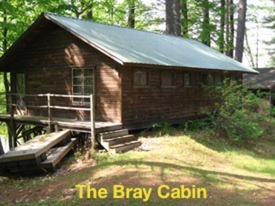 Before the camp session, the Bray Cabin was built in memory of Leonora "Orah" Hutchins Bray who died at camp during the Assembly session the previous year. Her husband, Rev. Everett K. Bray, was a core lecturer at the Assembly from the 1930's through the 1960's. © Nancy F. Little 20163. 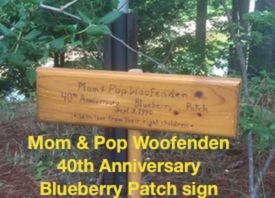 Before the camp session, the Woofenden Cabin is also built by Rev. William R. and Louise Dole Woofenden. 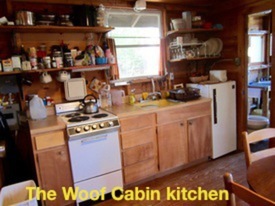 It is the first cabin to have a kitchen and electric heat (instead of a woodstove like all the other cabins had at the time), and is the only cabin built without a porch or a deck. Adult Bible Study class is held at the same time as the young people's classes three time each week. The Goddard Annex is built with a children's playroom and the back kitchen on the first floor, and the teen Girls Dorm on the second. 1. Sunday School Teacher trainings are, once again, a part of the Assembly program. 2. After camp in October, the Women's Auxilliary publishes a request for donations to next year's Sales Table, in part, to help "pay for a modern dishwasher for 1961." The FNCA rules and daily schedule are first posted in each room of the camp. Through a gift from Gwynne Dresser Mack and the entire Mack family in honor of Mrs. Laura Mack, the Mack Cabin is built as a dressing room for the Big & Little Boys, with the Big Boys Tent placed at one end and the Little Boys Tent at the other. 1. An article titled "A Brief History of the FNCA" by Mrs. Anita S. Dole, covering 1914-1968, is published in the July 1963 issue of The Maine Newchurchman magazine. 2. "A large new cooking stove was installed and many donations helped pay for it." 3. "A two hour concert was given by Jose Melis of the Jack Paar Show with Jose's son Michael on drums, and Ray and his wife Betty performing Cuban dances. Members of the Woofenden and Dole families also played and sang." Jose Melis was the younger brother of long-time FNCA © Rev. George F. Dole 1964member Ray Guiu who emigrated to the USA from Cuba. His wife Betty was the daughter of the Rev. Everett K. Bray, a core lecturer at the Assembly from the 1930's through the 1960's. 4. Mrs. Pauline Lawrence announces at camp her family's intention to build a cabin in honor of her late husband, Arthur. The Lawrence Cabin is the eleventh cabin on the grounds. 1. Co-founder Rev. Louis A. Dole passes on to the spiritual world. 2. 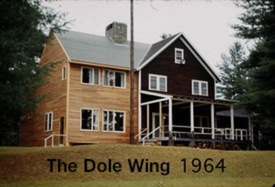 The Dole Wing is built in honor of Rev. Louis A. and © FNCA 1962Anita Sturges Dole. Rev. Dole was one of the FNCA's original founders, our first president, a core lecturer from the 1920's through the 1960's, and an FNCA officer from our inception until his death in February of this year. Anita S. Dole, who wrote the Dole Bible Study Notes, was a young people's religion class teacher nearly all that time, too. 2. Their son, Rev. Dr. George F. Dole, becomes the fourth FNCA president. 1. "The Dole Wing is furnished beautifully by the family of Mrs. Hazel Baker Clark as a memorial to her and part of their contribution to that wing." 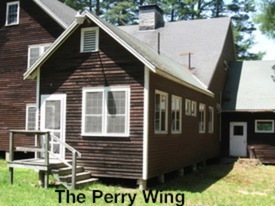 The Perry Wing is built off the back of the © Trevor 2011Main Building, with two rooms to house people who have trouble climbing stairs. It's the Fryeburg New Church Assembly's 50th anniversary! A full weekend of events drew lots of people who hadn't attended for years to the celebration. 2. This year, after being filed continuously since 1935, the minutes of the Women's Auxiliary of the Fryeburg New Church suddenly stop, with this years' being the last. Yet the Women's Auxiliary continues to run the Sales Table for 5-10 more years. 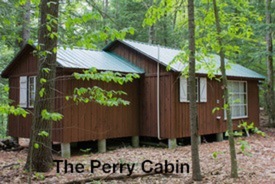 The Perry Cabin and the Bath House built are built by life-long members Fred & Nancy Perry. The third week of camp is dropped, bringing it back to the way it was from 1922-1931. 1. A large dinner bell is © Beki Greenwood 2009bought in Pennsylvania by the Rev. Dr. & Mrs. Wm. R. Woofenden and donated to the Assembly. It is braced into a fork of a tall pine tree at the edge of the lower lawn. Before this, program events were signaled by a runner with a handbell circling the entire camp for warning bells and the starting bells throughout the day. 2. A drawing is held at Convention for a free week at camp for two. This is done for a few more years. 1. Several acres of FNCA property at the northeast end of camp (beyond the current Boys Bunkhouse) are sold. A 1/2 acre sliver is sold to our neighbor, the Eastmans, at their request "to straighten their property line". The rest is bought by long-time FNCA members Ed & Wendy Schnurr. 2. The proceeds from the above sales are used to purchase two lots from the Weston Way housing development at the opposite end of camp in New Hampshire because they were uncomfortably close to the Perry Cabin and we didn't want permanent residences that close to camp. 3. An open-to-the-public homeopathy lecture was given by Dr. Richard Moskowitz, MD. It was quite well attended by campers, Fryeburg New Church members, and several other local people. 4. Four artists at camp arrange a two-day "Artists' Excursion" during camp into the White Mountains to paint and sketch. A similar trip is planned for the following year. 1. From the Bulletin: "...this summer on August 11, we will have Open House to the public from 2:00-4:00 p.m. (cabins neat and tidy, please!) Refreshments will be served." 2. Professional naturalist and long-time FNCA attendee, © Trevor 2011Anne Perry, is on staff, doing a program on nature study second week. 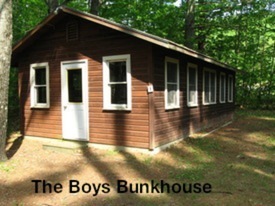 The Boys Bunkhouse is built on the concrete slab of the old Big Boys Tent. The Boston Cabin is built. Rev. Jim Lawrence becomes the next FNCA president. 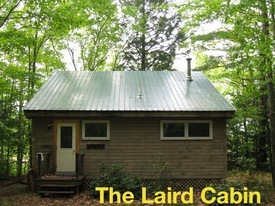 1.The Laird Cabin is built and dedicated. 2. Louise Dole Woofenden, daughter of one of our original founders, Rev. Louis A. Dole, is appointed Camp Historian by the Executive Committee (now the Board of Trustees). © Trevor 20133. Rev. Gard Perry, grandson of the third FNCA president, becomes the next FNCA president. 4. The retrospective column "Reflections", about the previous year at camp, starts in the FNCA Bulletin. 5. The first Alice F. Vigerstad Memorial Old Lady Canoe trip is a huge success and is repeated © Ian Woofenden 2016the following year and nearly every year since. 6. The 8 Woofenden siblings present the Assembly with 8 highbush blueberry bushes in honor of their parent's 40th wedding anniversary. These are planted in the far corner of the lower lawn. © FNCA 1996Ellen Morin, daughter of former FNCA president Rev. Wm. R. (& Louise Dole) Woofenden and granddaughter of FNCA founder Rev. Louis A. (& Anita S.) Dole, becomes the next FNCA president. 1. Lalla Searle, with a crew of relatives, begins a planting project putting in flowers and bushes that bloom in August and (in her words) "can suffer benign neglect the rest of the year" in front of various cabins and in the ravine between the front lawn and the Claxton Cabin. 2. A special Sunday dinner is held the final weekend celebrating the 50th wedding anniversary of Rev. Dr. William R. & Louise Dole Woofenden. 1. Don Foster becomes the next FNCA president. At their mid-winter meeting, the Executive Committee approves a much-needed update of the FNCA's administrative structure to be more in line with current standards for non-profit oganizations: separating policy making from program running, with an elected Board of Trustees in charge of the former, and a mostly ex officio Summer Session Committee in charge of the later, with the Camp Director also being elected by the membership. This proposal is approved by the membership at the Annual Meeting. 1. Adrienne Frank Fellowship Hall is built before camp starts. 2. The president, vice president, secretary, and treasurer resign from the newly-formed Board of Directors in July, a few weeks before camp starts. © Beki Greenwood 20143. Debbie Cook immediately steps in as Camp Director and is officially elected to that position at the Annual Meeting. John Perry steps up as chairman of the Board. And other volunteers immediately step into the other vacated positions pro tem and camp runs without a hitch. 4. The Flames 75th Anniversary celebration is very well attended with old Flames from more than a dozen states. Trevor, grandson of one of our original founders, Rev. Louis A. Dole, "inherits" the position of Camp Historian from his mother, Louise Dole Woofenden. 6 or 7 years later, he is officially appointed to this position by the chair of the Board of Trustees. 1. Ken Turley becomes the next FNCA President. 2. Deane Currie is elected Camp Director. 3. At Deane's request, we have our first Tie Dye Day where everyone who has one wears a tie dyed shirt. 1. Debbie Cook re-elected Camp Director. 2. Colgate Serle II becomes the next FNCA president. 3. The 18-22-year-olds enthusiastically accept a proposal to be classified as "Senior Flames" with all the privileges of adults but participating in the Flames program and paying Flames' rates, too. 1. This website, fryeburg.org, goes live on June 10th, becoming the FNCA's 3rd official website. 2. The Opening Weekend Program starts. © Trevor 20113. At the Annual Meeting, the membership votes to name the lecture hall, built in 1975, for one of our unsung original founders. It is now called the Rev. John Whitehead Lecture Hall, Whitehead Lecture Hall or simply Whitehead Hall. 1. Jason Greenwood elected Camp Director. 2. After operating informally for several years, the FNCA Outreach Committee submits a formal proposal to become an official committee of the Assembly. The Board votes favorably on the proposal. © Trevor 20113. 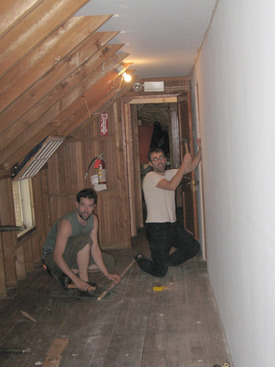 A new hallway is created on the 2nd floor of the Main Building between the upstairs bedrooms and the Girls Dorm. The first annual LALLA Searle Memorial Scrabble Tournament is held, with the finals held at a special party in Frank Hall. The first annual Rev. Dr. George F. Dole Celebration Three Mile Road Race (a.k.a. The Dole 3 Miler) is held on the Mountain Division Trail which begins at the Maine Visitors Center directly across the street from the Assembly. 1. Rev. Everett K. Bray Visiting Lecturer program is initiated. 2. The Summer Session Committee (with full approval of the Board) decides to discontinue the camp Bulletin since it is no longer really needed since all the necessary information it contained is now online. For the first time, on the final Saturday of camp, our lectures are live streamed on the FNCA Facebook page with more than 400 live "views" between the two of them. We have truly expanded our outreach!